As 1945 began, the Red Army of Workers and Peasants prepared for a winter campaign designed to crush Nazi Germany and bring the Great Patriotic War to a close. Fighting to end fascist tyranny and avenge thencl devastation of their homeland, Soviet soldiers fought with great determination, while their German enemies showed desperate courage in the last months of the Thousand-Year Reich. 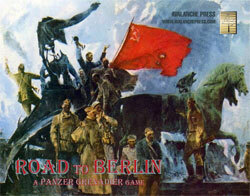 Road to Berlin is a complete boxed game in the Panzer Grenadier series of World War II tactical combat. Seventy-five scenarios re-create the furious battles of 1945, from the opening of the German counter-offensive in Hungary on New Year�s Day to the last stand of the panzers in Bohemia in May. They range in size from very large to very small. There are 825 pieces including the gigantic tanks fielded by both sides. The Germans bring the Tiger II plus other great beasts like the Tiger I, Panther, Jagdpanther, Hetzer and many more. The Soviets have their JS-2 and KV-85 heavy tanks, SU-76, SU-85, SU-122 and JSU-152 assault guns, SU-100 tank destroyers, T-34/85 and Lend-Lease Sherman medium tanks, and T-70 light tanks. Four distinct armies have their full order of battle: the German regular army (Wehrmacht) and Waffen SS, and the Soviet Guards and Red Army of Workers and Peasants. Each have their own troops, leaders and weapons. Smaller contingents are present for the German Navy and the remnants of the Royal Hungarian Army. There are eight semi-rigid mapboards, the same type as those found in Eastern Front and fully compatible with other games in the series. Learn to play Panzer Grenadier in just five minutes!